I was minding my own business today when I saw the most incredible thing, this framed sign was next to the ice tea dispenser in the Elk Grove Dos Coyotes restaurant. 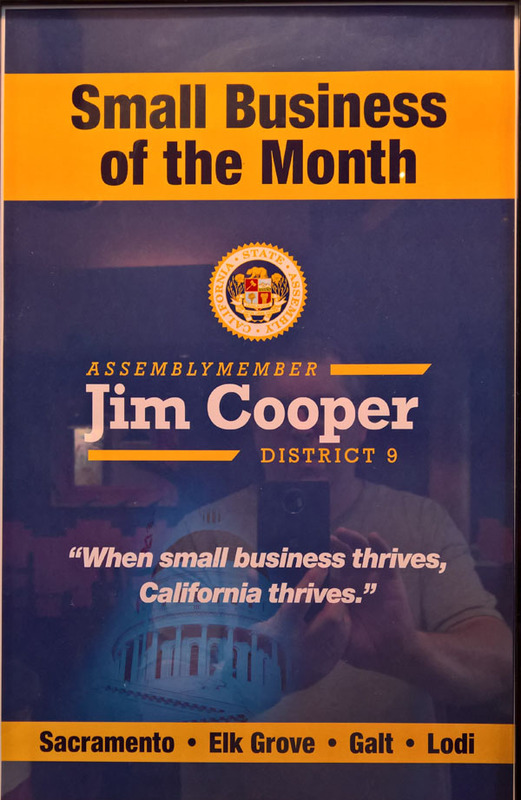 Jim Cooper—our local Democrat Assembly member is the small business of the month. Where is this award from; perhaps Texas? Cooper is a waste of a politician. He wants to take away our freedom and give more power to the state. His only legislative claim to fame was introducing a bill to require Apple to put a backdoor into their phone operating system so government could snoop on its citizens any time they wanted. Cooper and his Party have made California the worst business climate of any state in the union. It must be rainbows, butterflies and unicorns for Sacramento liberals, as California successfully defends its crown as America’s CEOs again named California the worst state to do business-for the eleventh straight year. California has received a grade of F in small business friendliness, according to Thumbtack’s fourth annual Small Business Friendliness Survey, which surveyed over 2,000 small businesses in the state on a broad range of policy factors. California not only earned an F in overall friendliness, but in ease of starting a business, business regulations, labor regulations, tax regulations, licensing forms and environmental regulations. The state also received a D+ in health and safety regulations and zoning regulations, as well as a C- in training and networking programs and C in ease of hiring. Before getting to the Assembly, Cooper ran for sheriff on a platform of financing the department solely by revenue from traffic cameras. Somehow the media didn’t think this was noteworthy enough to document at the time. The only reference I can find is listed below. Proposed new taxes. Big proponent of red light cameras (in fact, it was the first thing he brought up when asked about budget issues on the 1380 KTKZ debate). Lastly, California government—including Cooper—doesn’t produce anything. Cooper is getting $173,000 in retirement plus his salary as an Assembly member. Assemblyman Jim Cooper, D-Elk Grove, $173,820. Cooper retired two years ago at age 50 as a captain with the Sacramento County Sheriff’s Department. At least 16 other state lawmakers collect two checks each month, including Assemblyman Jim Cooper (D-Elk Grove), who retired two years ago at 50 as a captain in the Sacramento County Sheriff’s Department. When added to his legislative pay, Cooper’s annual pension of $173,820 brings his total income each year to $273,000. The idea that Cooper could be called a small business man is ridiculous. Lastly, I find it suspicious that a business based in the liberal enclave of Davis, just happens to pick Cooper as the business guy of the month at the same time ballots are being mailed to voters in his district. Dos Coyotes has never had a business of the month until Cooper’s name just happened to show-up on their wall. I know, I frequently eat there. I think this is backhanded in-kind contribution for some unnamed favor that Cooper did for them.